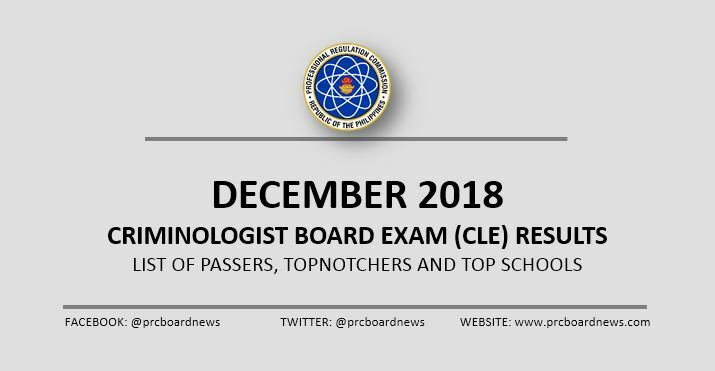 MANILA, Philippines – (Updated January 12) The Professional Regulation Commission (PRC) and the Board of Criminology released results of December 2018 Criminologist board exam or Criminology Licensure Exam (CLE) on Saturday, January 12, 2019 or in 15 working days after the exam. The official list of passers, top 10 (topnotchers), top performing schools and performance of schools are available on this page as announced online. As announced, 14,324 out of 41,341 passed the exams. The results of examination with respect to 11 examinees were withheld pending final determination of their liabilities under the rules and regulations governing licensure examination. PRC conducted the Criminologist board exam on December 14, 15 and 16 (Friday to Sunday) in Manila, All Regional Offices, Zamboanga, General Santos and Rosales, Pangasinan. The three-day exam covered the following subjects: criminal jurisprudence, procedure and evidence and law enforcement administration, criminalistics, crime detection and investigation ; and sociology of crimes and ethics and correctional administration. According to PRC Resolution No. 2017-1068, the target release of results for December 2018 Criminology board exam is on January 10, 2019 (Thursday) or in 13 working days after the exam. In the same period last year, PRC announced results in 21 working days. A total of 13,025 out of 36,516 (35.67%) passed the exams. In the October 2016 CLE, results were announced in 25 working days. PRC named 10,901 out of 34,768 (31.35%) passed the tests. PRC Board News advise examinees to monitor announcement of results from January 4 (Friday) until the 18th. As far as I can see, there are so many advantages to use your creative blog. It is a real enjoyment to read your articles. Wala papo bang result untill now? Dugay lage result krn CLE..why man? elite beautiful delhi escorts for VIP peoples.